Our yearly gathering of ambitious women is gearing up for the weekend of October 13th, 2017 (mark your calendars), and we couldn't be more excited! Now in our third year, we're aiming to create a conference experience better than years prior. "How?" you may ask. Well, for starters we're planning on making this a full Friday-Sunday experience. Friday will kickstart our weekend with our keynote speaker(s) and panel discussions that'll make your mind, body, and hearts burst with inspiration, motivation, and courage. Our topics have been chosen to create empowering conversations between our panelists and attendees, so don't be afraid to speak up this weekend! Saturday will host our business and entrepreneurship workshops - learn everything from marketing on a budget to how to start your first podcast! We'll then end our weekend with some mind/body love on Sunday - think yoga and brunch. We're finalizing details and the full experience to share with you all, but for now, here are seven more reasons you should attend this year's FearlessCon! Meet other women just like you who are looking to create a life and career they love. Expect a great mix of women from all ages and backgrounds, entrepreneurs and 9-5ers, students, moms, etc. Don't be shy and go on and create your own girl gang! FearlessCon is one of the best ways to invest in yourself. From our inspiring speakers and panelists to the nitty gritty details of running a business during our workshops, you'll leave with new tips and strategies for your dream career. You'll learn how to turn your passions into income, and there's nothing better than getting that paid for what you love to do! We'll be curating a booty-ful goody bag this year from vendors from all over the world. Expect everything from beauty, health, wellness and workplace inspiration within your goody bags this year! (P.S. If you'd like to be included in this year's goody bag, hit us up here!). Come hungry as we'll be providing a catered breakfast, lunch and snacks throughout the weekend. Dinner plans are left to you all, but we'll be giving you all some suggestions of Philly's best restaurants and must-eats if you're from out of town. We're crafting up some special surprises as well, so stay tuned! We're all about bringing together speakers and panelists that will not only make you go "ooohh and "aahhh" but will also bring out a new side of you. Attendees have left inspired to quit their full-time jobs to pursue their passions or asks for raises (and succeed!) at their current jobs. Don't expect anything less this year. The end of FearlessCon is always bittersweet. You've made new friends, received honest advice from badass career women, and you've spent a whole weekend dedicated to furthering yourself, both personally and professionally. As one attendee said, "FearlessCon is genuinely a great space for people to come together and discuss their successes and passion. I would hands-down recommend it to anyone, especially since there is nothing like it." We'll be opening up early bird ticket sales this June, as well as announcing our schedule and speakers, so stay tuned for another year of being fearless. See you all in October! Update: 2017 digital conference access can be purchased here! While details for our upcoming Philadelphia FearlessCon are TBA, join us for our first ever digital conference, held on May 12th, 2017! This Friday afternoon event will take place from the comfort of your own computers, and will be available to watch at any time after the live broadcast! 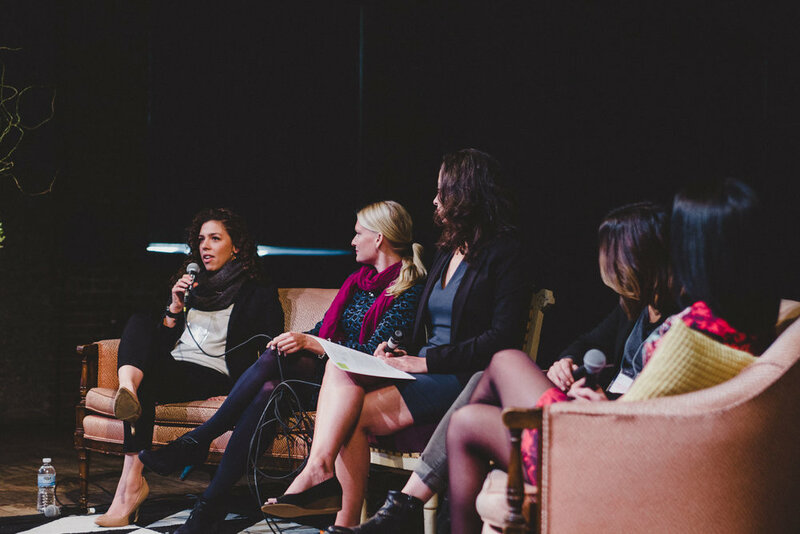 If you're a badass, creative women looking for entrepreneurial strategies and advice to grow your business, this is one event you won't want to miss! Six fabulous women from around the world will be teaching topics on branding, public speaking, public relations, social media and more. View our fabulous speakers and conference schedule below! Get ready to hear opening remarks from Femme & Fortune and FearlessCon founder, Melissa Alam, on what to expect during the conference and how to use the platform to connect with other boss ladies around the world! The creative 'trep life can get lonely when you're hungry for the hustle, but it doesn't have to be. Get inspired by speaker Fatou Barry of @PRGirlManifesto as she shares the importance of authenticity in growing your brand and reaching the right people. During this session you'll learn how to establish rapport with YOUR people and funnel your followers into valuable, online + offline experiences. The success of your business depends on you clearly communicating what you do to others. To stand out, to be remembered, and to convince people to buy into your vision, you need to know what to say and how to say it. By creating a connection with your audience, you can attract the right people to your business so they become your clients, colleagues, and your community. And what’s your secret weapon to cultivate that connection? Your story. Learn the 3 fundamentals of storytelling to wow 'em with your elevator pitch with storyteller and communications strategist Kay Fabella. Co-founder of Knotty Gal, Nur-E Farhana Rahman is here to share her story of creating her business model with a philanthropic angle. What are ways of giving back to different communities without looking too cheesy? How can your business make an impact that makes sense for both the charity and your brand? Some of these questions and more will be answered thanks to Nur-E! Great branding is pivotal for your business to stand out against competitors. What are some elements of your brand that you're missing and how can you create the most cohesive look and feel to make your customers and clients coming back for more? Brand stylist Kristen Poissant is here to fill you in on all of her secrets. We're with you - it ain't easy taking the leap from a stable career to the one you dream about. Join Asia David (Creative Director of BunchMag) as she guides you on gaining the courage to go full-time with your hustle. In her own words "My journey has ultimately been about trying new things, following your own compass, and asking for what you want." Get ready for actionable tips on losing the fear and preparing yourself to fly. We all know about the dreaded press release, but what are some modern ways to share your big idea and business with the right people? Reena S. Goodwin, founder of FACTEUR PR, will be sharing strategies for getting you the press you deserve! Closing remarks and an official cheers for attending the first digital FearlessCon! Happy hour anyone?